Here is a kind of ginger that is evergreen. That means you can find it in winter woods when there is otherwise very little green to be found. The waxy green, heart-shaped leaves of Heartleaf are often mottled with white (variegated); the leaf margins are smooth (or entire). The leaves and rhizomes are aromatic. Don’t be surprised to find Heartleaf emerging from the ground as a single leaf. Other times, and often in the same area, you’ll find just a few, long-stemmed leaves growing together in a haphazard group. Older plants have more leaves, and in the springtime, more flowers. The hidden flowers are born at the base of the plant. You will have to follow the stems and then dig down close to the ground to find the flowers (they are always obscured by leaf litter). Keep looking though- it is worth the hunt! There are several kinds of “heartleaf” in the Appalachians, and they can be confusing to identify to species with certainty. In the photo gallery below, I think I have Variable Heartleaf and possibly Little Heartleaf too, although I don’t know for sure. The waxy, urn-shaped flowers of these two species have three, widely-spreading lobes. The typical flower color is deep red (or reddish purple) with white mottling. The color and amount of mottling can vary considerably. While you are here, also check out Virginia Heartleaf, a species with leaves that grow in a tight clump and with a somewhat different-shaped flower. 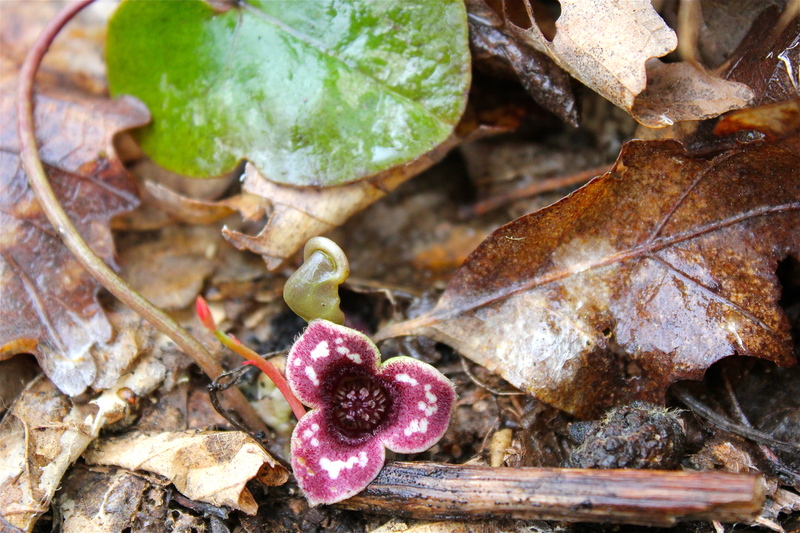 Finally, contrast these heartleaf species with Wild Ginger (Asarum canadense), which has leaves that are larger, velvety, and deciduous. The big flowers of Heartleaf!